Walker (see Syria) writes, " IRAQ, ignoring Saddam Hussein, went from being a British mandate (#1) to a Kingdom (#28), to a Republic (#188). 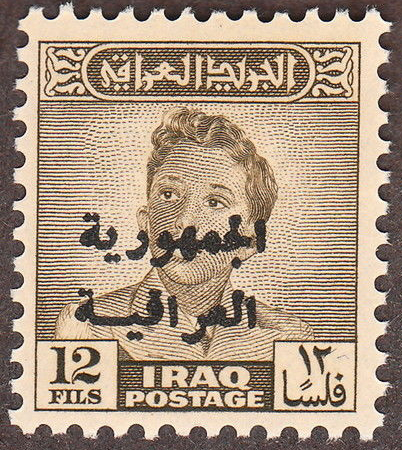 You might also want to include the Mesopotamia occupation issue (#N1) in the lraq section. " 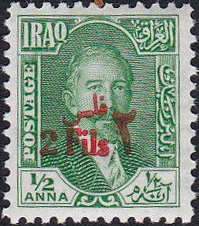 ‡Scott  begins Iraq in 1923 with the stamps issued under the League of Nations mandate of 1920. The separate listing for Mesopotamia are all treated as occupation issues with an "N" prefix. Gibbons  lists both phases under Iraq. † The catalogues also differ on the issue denoting the Independent Kingdom: Scott 1932 Sc28§ SG106; Gibbons 1934 Sc61 SG172, although Gibbons does note, "[the] British Mandate was given up on 3 October 1932 and Iraq became an independent Kingdom." ◊ The first issue of this set for both Scott and Gibbons is the ¼ anna on 2 piastres claret, a vertical stamp, not the horizontal ¼ anna on 5p violet-brown that seems to be much more readily available. 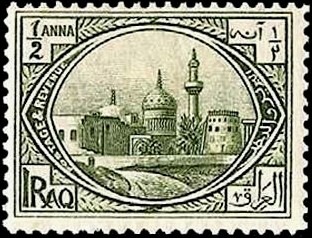 § Sc28 is the 2 fils on ½ anna overprinted in red. The image of the Sc28 above was taken from this full set (excluding variants) of the overprints selling on ebay for $999. Sources: ScC , ScS, SGP19 . 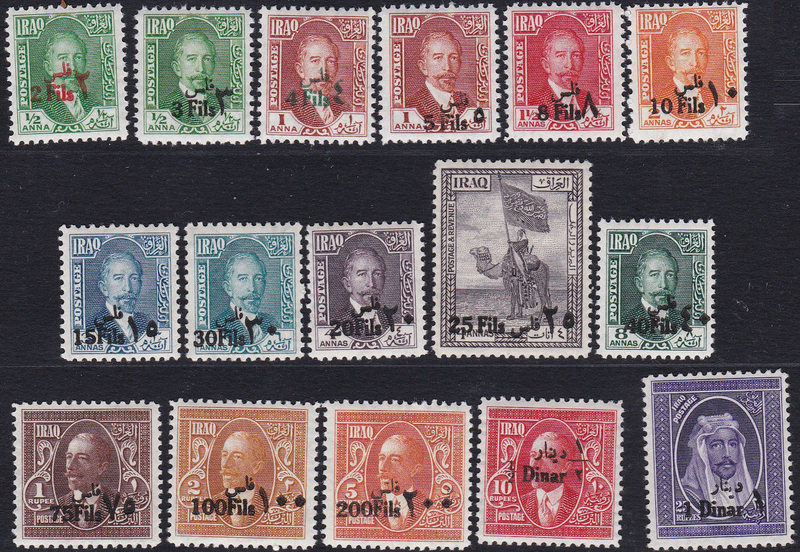 Images from colnect, Delcampe, CommonwealthStamps, ebay.